In fact, I adore this fabric so much that I'm trying my best to get 20 yards of it in a new colorway this year to make bedroom curtains. Crossing my fingers that this doesn't fall through because I have a VISION. I love all the windows and light in my house. But damn. It makes window treatments expensive. So this dress. It's another one that I made last year and am just now blogging. 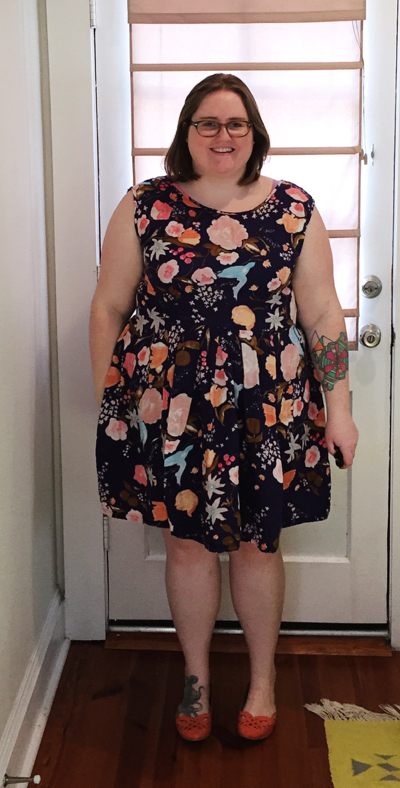 I returned to a tried and true pattern for this one, Simplicity 1873. I think this was version 5, and I've made several more since then. I keep going back to it because I had the bodice fitting so well and it's a simple vehicle for a good print. My latest two versions I ended up taking in pretty significantly at the waist (whoo hoo Weight Watchers!) so I may need to re-muslin at this point. After about a year, I can tell you that this is a well worn, well loved dress. 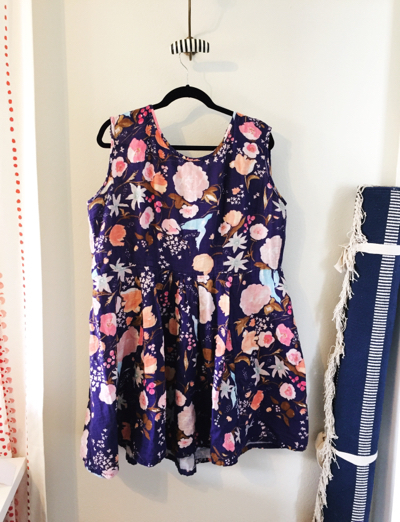 I wanted an easy breezy summer dress, so I skipped the bodice lining. I bound the neck and armholes with self bias strips, which is a bit more casual than the lined bodice in the pattern. I like top stitching so it works out. I just adore the skirt on this pattern. It has 5 panels and many pleats, but it's manages to be full without being unflattering. I actually made a skirt using the pattern pieces (just with a straight waistband) last week and it turned out beautifully as well. The shape is much more flattering than a gathered rectangle or box pleated skirt. I love this dress and it's probably in my top 3 most loved items of clothing. Actually, when I did the KonMari method on my closet a couple of months ago, this was one of the items that I immediately thought of when I was trying to identify what sparks joy. And it truly, truly does.